Our guiding mission at Chegg is to help students Save Time, Save Money, & Get Smarter. We conduct research to better understand our users and to improve our products. Sign up now and we’ll contact you if a research study matches your profile. By participating and providing us with your feedback, you’ll impact the future of our products. We run research sessions in our Santa Clara lab and remotely over the web. We're looking for many types of participants. If you're located in the United States and are a high school student, college student or the parent of a student, you may be able to participate in our studies. During a research session, you'll try out a new product or show us how you use current products. Our researchers will ask you a series of questions and you'll give them your honest feedback. You can earn between $25 and $150 for participating in our studies. Payment is handled via Tango Card. Our Research Assistant will give you details regarding payment for the study you participate in. Earn a $100 Tango Card for every 20 students you refer to participate in our studies through our Referral Bonus Program! See below for details. Post the survey link to your personal Facebook page, your Facebook groups, your Instagram account, or your Twitter account (see example here). You may earn one (1) $100 Tango Card* for every twenty (20) verified referrals (see IV. REFERRALS in the rules below) you obtain. You will receive your Tango Card approximately 1 week after you’ve accumulated 20 verified referrals. 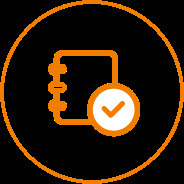 Receiving the Tango Card is dependent upon the number of qualified referrals you receive. 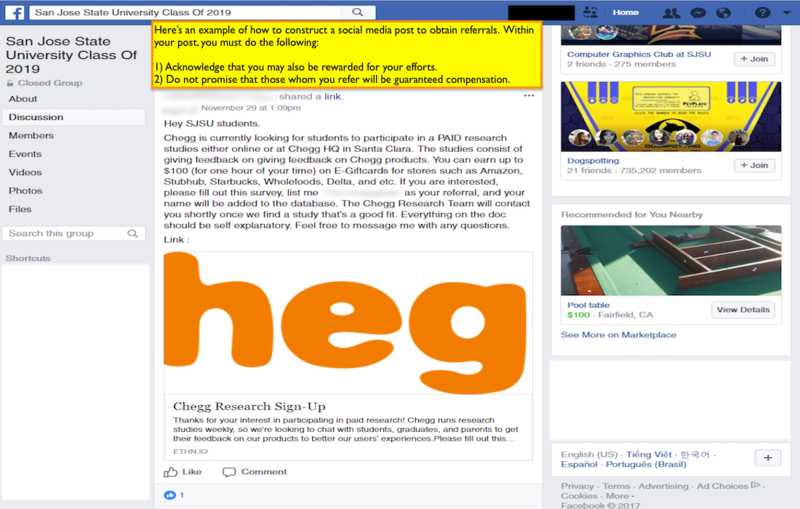 * Chegg’s Referral Bonus Program rules and limitations can be found here. In 2016, Chegg UX Researchers spoke with over 1415 high school and college students, and collected data from over 7000 survey responses. Learning directly from students helps make our products better. A Researcher might invite you to come to a Chegg office to ask questions and show you something in development to get your feedback. This type of study typically takes 1 hour. Remote research is like Onsite except it happens over the phone or web conference. The Researcher will show you various product designs via screen-sharing and get your feedback. During a field study, one of our Researchers will interview you at your home or office. This type of study typically takes 1-2 hours. Sometimes Chegg Researchers simply need people to respond to Chegg product-based surveys. Survey completion typically takes 5-10 minutes. Want to help Chegg build better products?